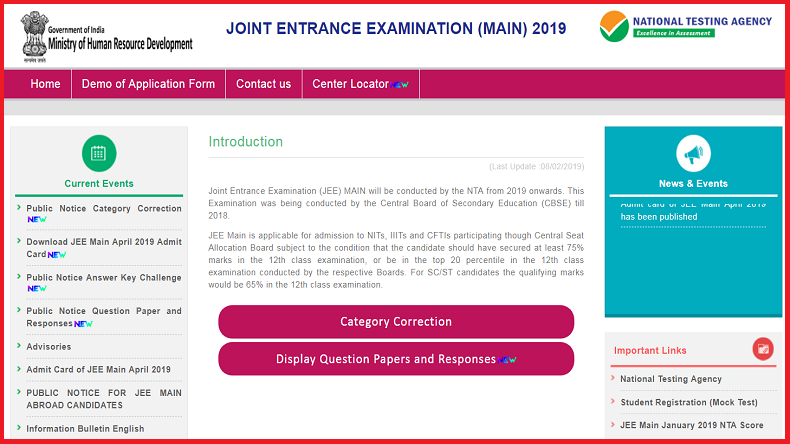 JEE Main application: The Joint Entrance Exam (JEE) 2019 application form correction facility has been reopened through the official website of the National Testing Agency (NTA). According to the reports, candidates belonging to Economically Weaker Section (EWS) can change their category in the form as the NTA has added a new EWS at jeemain.nic.in. The National Testing Agency, which is the examination conducting body for Joint Entrance Examination has added a new EWS list in the category to the application form for candidates. The NTA will allow the candidate to correct the errors made in their application forms or in the categories till April 17, 2019 through the official website of JEE Main. NTA also said that this will be the last chance for the candidates to make changes in their application form and no further chance will be given to them after the closure of the process on the scheduled date through the official website. How to make the corrections in the JEE Main application form?